Figure 1: A long wire located distal to the terminal bracket is irritating the mucosa. Figure 2: Orthodontic wire irritating the inner mucosa. Figure 3: A fixed orthodontic appliance that has come loose. An ulcer may develop on the mucosa, which has the potential to result in an infection. This can manifest as an irritation on the mucosa of the inner cheek. The diagnosis is arrived by an intraoral examination. Long wire: Cut the orthodontic archwire. Loose bracket: Only pursue emergency treatment if the patient complains of discomfort or if there is visible irritation or pathology to the mucosa. Emergency treatment may involve untying the bracket and removing it, and cutting the wire mesial and distal to the bracket to remove the bracket. Cut the wire as close as possible to the adjacent brackets to prevent further irritation. Loose appliance hanging from the patient’s mouth: Remove the appliance as the patient is at risk of swallowing or aspirating it. If the patient is wearing a maxillary expander and is in the active phase of expansion, the orthodontist should be contacted immediately to attempt to re-cement the appliance. 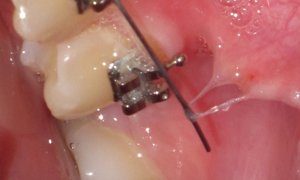 The achieved expansion can relapse quickly and make re-cementation of the expander extremely challenging. A new expander may have to be fabricated following a resting period, to allow for full relapse to occur. Have the patient contact their orthodontist to replace the broken bracket or loose appliance. Send a follow-up report to the orthodontist. Check all wires prior to dismissing patients. Use strict protocol when bonding or banding orthodontic appliances.